In September of 2007, it was reported that of all the 101 shows that took place during New York fashion week, one third employed zero models of color. Since then, we've tried to track diversity on the runway every season. We do this here at Jezebel because what we see on the runway — and who wears it — influences the faces we will go on to see in magazine editorials, advertising campaigns, and all the other images the fashion industry will create over the coming season. The models who walk in the shows are working with the stylists who matter, and being seen by the top editors. Those stylists are thinking of the campaigns, editorials, and other jobs they'll be consulting on over the coming months; the editors are thinking of their feature wells and the garments and stories and faces that might fill them. The industry at large is watching these shows and thinking: Who has buzz? Who's that new face? Who do we have to have? The runway is like a hopper that feeds the fashion industry's image-making machine. And the fact is that those images overwhelmingly feature white faces; this, we believe, perpetuates the cycle of marginalization and racism experienced by people of color. Even if, come spring, you don't buy any of the overpriced designer clothes fashion week notionally exists to unveil, and even if you are not a habitual reader of the hard-core fashion magazines, chances are you'll still be bombarded with the perfume ads, the Gap campaigns, and the Maybelline billboards — not to mention the garden variety ladymag editorials — that will stem from this season and its casting. This fashion week, there were 128 New York shows and presentations that were covered by Style.com. (We've always used Style.com as the basis for our data because it publishes look-by-look slideshows, often with models' names included, for a comprehensive swath of New York's shows.) Those 128 shows together presented 4,170 runway looks. That means 4,170 opportunities to choose a woman or girl to model that outfit. 3,410 of those opportunities, or 81.8%, went to white models. That means of course that 760, or 18.2%, went to models who were non-white. 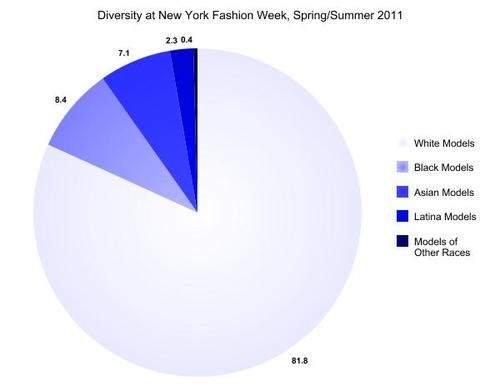 Non-white Latina models were used 95 times in all of fashion week, or around 2.3% of the time, and Asian models were used 296 times, or 7.1% of the time. Black models were used 353 times, or 8.4% of the time. Models of other races, like the Moroccan Hind Sahli and the Canadian model Tara Gill, who has Native American heritage, were used 16 times, or 0.4% of the time. Since Jezebel has been been tracking the relative diversity of New York fashion week for so many seasons, I thought I'd try and chart the last few seasons and their numbers. (We did not generate data for Spring/Summer 2009, or Spring/Summer 2010.) You will notice that this season presents a small improvement on six months ago, in terms of its diversity, but that essentially New York fashion week is right back where it was 18 months ago. Lots of people within fashion will tell you that casting models is an extraordinarily complex, creative pursuit, one that requires balancing multiple subjective qualities (does this model give me the right feeling?) with more objective ones (does this model fit the clothes, and can she walk?). Some people always say that choosing a cast that suits a designer's creative vision is more important than taking even the most basic steps to insure that cast isn't all-white. (At least, the apologists for the status quo prefer to talk about designers and "creative visions" rather than about casting notices that say "No Ethnic Girls" and black models who say they work less than their white friends.) But why is it considered acceptable for a designer's creative vision to not include people of color? Do those designers not want any black or Latino customers either? There were also plenty of shows that had all-white casts but for one or two models. Anna Sui, Calvin Klein, Donna Karan, Jeremy Scott, Jill Stuart, Narciso Rodriguez, Rodarte, Diesel Black Gold, and Thakoon are among them. What's worrisome is that that list is thick with some of the most influential and prestigious labels in all of fashion. And they don't seem to see any use for more than a couple token models of color. Mass-market powerhouse Max Azria, via his brands Hervé Leger by Max Azria, Max Azria, and BCBG Max Azria, booked his customary nearly all-white casts, all while telling us he was the "king of diversity in fashion." Who were the designers who did things better? 3.1 Phillip Lim, who hired nine models of color, and Sophie Théallet, who showed 13 of her 32 looks on models of color, were among the buzzed-about younger designers had very diverse casts. Among the old guard, Carolina Herrera (11/52), Oscar de la Renta (13/60), and Diane von Furstenberg (17/50), had the most diverse casts. Rachel Comey, Betsey Johnson, Costello Tagliapietra, Tara Subkoff's relaunched Imitation line, Jason Wu, Christian Siriano, Gwen Stefani's L.A.M.B. line, both Marc Jacobs and Marc by Marc Jacobs, and Richard Chai were also among those labels that valued diversity in their casting. Melodie Monrose, with 19 shows including Tory Burch and Rag & Bone, was fashion week's top black model. Shena Moulton and Joan Smalls, who booked 13 apiece, were second. Moulton was the only black model at Calvin Klein, and Smalls walked for Alexander Wang, Derek Lam, and Michael Kors, among others. The top Asian model at New York fashion week was again Liu Wen, who walked in 18 shows. Fei Fei Sun and Shu Pei Qin had 16 each. Among non-white Latina models, Simone Carvalho booked nine shows, while Juana Burga had a respectable eight. The only models of other ethnic backgrounds to speak of were Hind Sahli, who worked six shows, and Tara Gill, who booked three. Why doesn't fashion — especially multi-national brands whose profitability rests on convincing the largest number of consumers possible to purchase their perfumes, underwear, and diffusion lines, like Calvin Klein — have more consideration for the beauty and worth of people who aren't white? Is New York fashion week plateauing at around 82% white, no matter how much advocacy or consciousness-raising gets done, or how many trend pieces get written about this issue? Will it ever become unacceptable to put on a fashion show in a thoroughly multi-racial city like New York and not hire a single model of color? Will it ever become unacceptable to blame that choice on an alleged "creative vision"? As long as these questions remain, we'll continue to ask them, time and time again, and look for answers in seasons to come. Fashion Week in NYC is a slap in the face to New Yorkers. With less than 50% of the population being white, a quarter black, 12 percent Asian and 27% hispanic, why should we give up any public space or city services to promote and facilitate an event that portrays ideal beauty as blond, blue eyed and eastern european. Start a boycott of fashion week but even more so, the designers that whitewash their runways. Hit em where it hurts.